When I was five, people asked me what I want to do in life and I just said, “I want to bring about a difference”, they found me cute and let me be. But I guess that’s when it started. All my life, I was told I need to be an engineer. Just like my Appa, Just like my Akka. So automatically, when something broke in my house, my Amma just assumed that the house is full of engineers and everything will be FIXED. So when the bulbs or the wifi stopped working, things would be soon fixed. And I too, was going to get into this vicious cycle of “fixing stuff”. Because we are engineers, that’s what we do. And so a year went by, my first year at NITK Surathkal and I still was clueless as to how to fix anything. It was a bunch of stuff studied, written down and brushed aside. And in the midst of this all, I came across the words “DREAM SCHOOL FOUNDATION” and I think at that moment, my life somehow changed. I sent a mail in January asking if I could volunteer during my summer and I got a reply the very next day stating I can join them whenever I wished to. This reply elated me. I was excited. Because for the first time, I was doing something different. Something to stick my initial words of bringing about a change, however miniscule it is. And enthusiastically, on my first day of vacation, I was there along with my friend Deepthi Hegde from NITK as well. I was Nervous, excited, scared all at the same time. Will the kids like me? Will the staff like me? What if I don’t do a good job? A million questions and I just sat there waiting. And almost instantaneously, all my inhibitions were gone .And honestly, I do not know how the two and a half months just passed by. 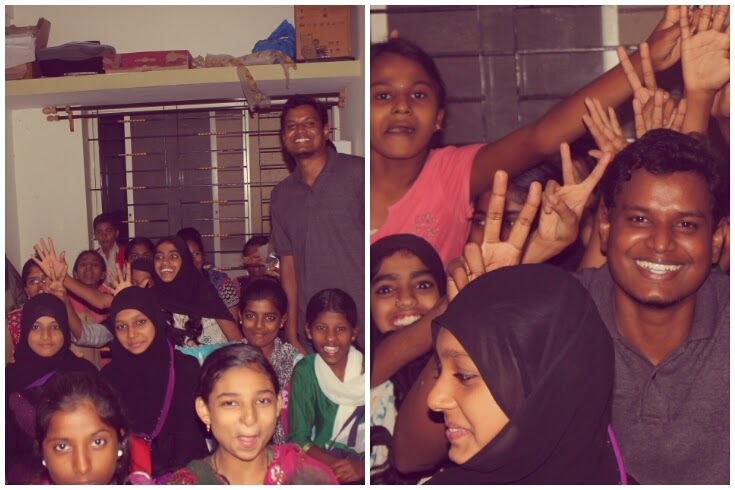 We were put in charge of being project buddies for the kids’ annual day which was scheduled to be on the 29th of June 2014. And while teaching chemistry, Physics and Biology, we engineers who primarily fix stuff, found ourselves heart broken. These kids are from the lower economic strata of the society. They come from tough backgrounds and harsh surroundings. There is a boy who supplies newspaper at five in the morning, does a mineral water supply to houses after school , helps out in repairing mobile phones and yet manages to get full marks in all his tests in school. Another girl who in spite of being from an extremely tough background, choreographs songs for various events and still tops her class. And these are just some of the heroes we came across. And yet, they come enthusiastically, filled with joie-de-vivre ready for class every day at 5 pm,with a zest to learn. And they speak of their hardships, without a hint of pain and a bright smiles on their faces. And our hearts break every time they ask us doubts, every time they ask us how our days went. Our hearts broke more when we’d spend the morning watching movies in multiplexes while they spent it doing jobs to keep their families running. And yet they lived life to the fullest. Happy, content and enthusiastic to learn. And while our hearts ached for them, we were inspired to see their hidden talents burst out during their annual day. With a plethora of activities such as science experiments, dances and songs, they blew us away on their annual day proving that they are just as good, just as talented as any other kid out there. This article would be incomplete without mentioning the staff at DSF. Words cannot even begin to describe how amazing they are and how they will always be engraved in our hearts.The tact and skill with which they face problems and at the same time, get along wonderfully with us, is something worth admiring. Filled with enthusiasm, extremely amicable, they continue to inspire everyone around them. So while we found our hearts broken initially, In spite of us being engineers and meant to fix stuff, The Dream School Foundation, the staff, the beautiful kids somehow fixed OUR broken hearts. And with heavy hearts we left to pursue our second year at NITK. And I cannot stop. DSF changed me. I need to make a difference. I need kids and their magnetic enthusiasm around me. And without them, I feel like a part of me of me is missing. SO when people ask me why I do, what I do, I give them a very engineery answer. So I’ll give you that answer as well. The basic language of coding is C, and there is something called a random function. It generates a number between 0 and upper bound given by you. So let’s make a deal, that I’ll give the upper bound and you give me that much cash. So when I give you the upper bound as 5, you’re okay. After all Rs.5 isn’t a big deal for you. When I give the upper bound as 40000, you begin to think, but let’s say you still give me that much cash. But now if I keep the upper bound as 7,000,000,000 , then you laugh at my face saying who in the world will take that chance. 7 Billion is the population of the world. And that is the exact same chance, exact same probability, exact same luck that a poor kid sitting in some slum got. Is it fair? How is it fair that you had the exact same probability factor as the kid in the slum, and yet you’re sitting in front of a laptop reading this article while a kid somewhere in the world goes to bed hungry. So I am not saying that I’m going to educate this kid and he’s going to discover the cure for cancer. All I’m saying is, that by educating him, I’m going to give him the same luck, same chance, same probability that you were bestowed with. Dream School Foundation has changed so many lives. And I hope that someday, I can reach up to the ideals it stands for. Youth for Seva (YFS) put me in touch with the Dream School Foundation (DSF) and I would like to start off by giving my sincerest thanks to them for this. My two month of volunteering or internship with DSF has been bittersweet to be honest. It started off with me helping out with their Summer Camp at the RT Nagar Government Schools. The co-volunteers were entertaining, you could say, but it was still a daily struggle for me. The general public using the school grounds was anything but cooperative. Stones being thrown on the tin roof was a daily occurrence and of course the scorching heat and lack of ventilation did not make it any easier. Despite all of this, I was amazed to see at least 80-90 children come in every day, all cheerful and excited. I would of course be lying if I said they were all very eager and interested in the activities of the summer camp but barring a few bad apples, there was great participation from the rest of them. Teaching for the first time had its own challenges. I was anxious about teaching a whole class full of people. But the kids really made the process easy for me with their genuine interest and class participation. I taught them a few topics and learnt a few lessons myself. It was wonderful to see how quickly they absorbed new information. Admittedly, they were a little behind for the kids their age (the schools are at fault for that) but I am certain these bridging courses provided by DSF at the summer camps will go a long way in reducing this gap in learning. We also conducted games everyday for the participants which were not only fun, but also promoted team spirit and led to greater bonding between students and between students and volunteers. All in all, it was a pretty great way to kick off my two-month stint at DSF. These schools are apparently built on disputed land and so, they do not get funding for renovation and repairs from the Government of Karnataka. This was shocking to me as it shows grave nonchalance on the government’s part towards something as important as a child’s education. However, DSF was able to secure funding and renovate these schools and give them a fresh coat of paint once the summer camps ended. They also took the initiative to make artworks in the schools related to their syllabus and also gave the schools a vibrant appeal, making it more conducive for learning. I would like to thank YFS once again for its huge volunteer bank and the platforms through which I could reach out to the volunteers and get about 10 of them to help with the artworks. I am not a very artsy person so it was quite a challenge for me. But I learnt as I went along and one of the YFS volunteers was a great help in making me more comfortable painting on walls. The final result of this project was breathtaking. The school had a very bright and colourful appeal to it once we had completed and I do take some pride in that. After all of this was completed, I headed to the New BEL Centre of DSF to help them with a play their students were going to perform at the DSF Annual Day. I had dabbled a little into theatre here and there so it wasn't too much of a challenge. Also, they had another intern working with the actors for quite some time, so the actors were in a good position when I stepped in. Despite a few last minute problems with the costumes and the set, to hear people enjoying the play you have worked on for a month is enough to make all that trouble worth it. The staff at DSF is amazing to work with and it will be difficult to part ways with them as they have guided and helped me so ably through the course of these two months. It hasn't all been easy but I would like to believe I have faced the challenges that came head on and come out a stronger and more adaptable self. And as to if I think this journey has changed me? Walking back home on my last day from Impressions 2014 (DSF Annual Day), I saw a little girl riding with her father on a bicycle. I know there is nothing rare or special about this and I might have seen such a thing many times before. But this one time, there was a slight difference; I smiled at the little girl. The year-end brings with it a season of joy and giving. 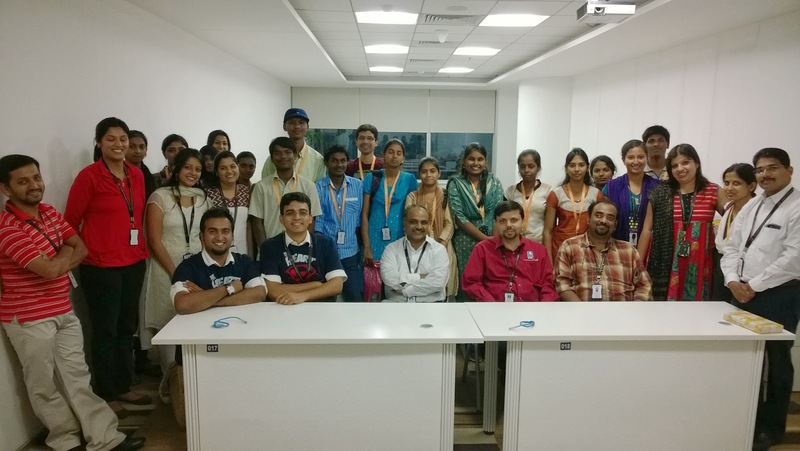 In keeping with this spirit, Pramati Technologies, Bangalore , invited the undergraduate students of the Dream School Foundation for a tour of their office premises and to be a part of their Christmas celebrations. As the students gathered at the entrance of the World Trade Center, the excitement was palpable. Passing through Fort Knox like security, we headed up the elevator. Nestled on the 15th floor, the plush office of Pramati was a reflection of it's core value-- innovation . 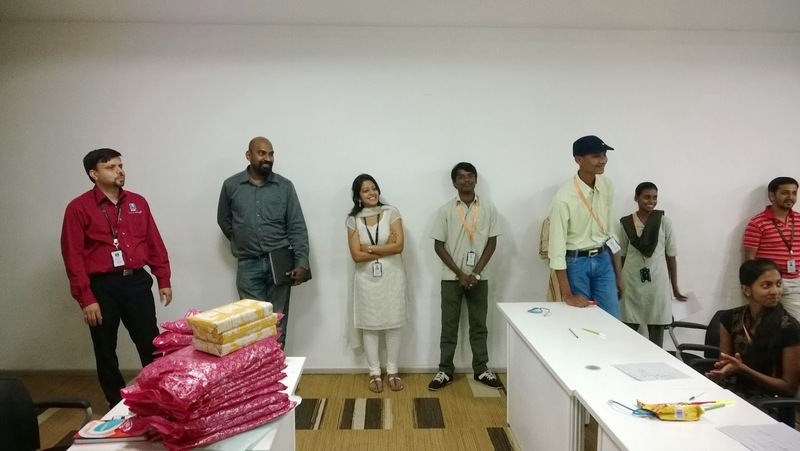 We were warmly received by Shobha, the HR manager and her associates. As they were ushered in, little did the students expect what they were going to be privy to -- a product launch! Taking the floor, Mr.Praveen, VP products, spoke passionately about the new product and its features. The students listened intently, understanding the value of innovation and learning the art of presentation. After a high energy interactive session, where the team at Pramati posed questions and reviewed the product, it was time for some fun! What better way to add excitement to the festivities than a game of secret Santa! After days of playing cat and mouse, it was time to reveal the secret Santa. As people exchanged gifts amidst laughter and cheers, the students saw that work can also be fun. After gifts, it was time for some cake. As everyone sunk their teeth into some delicious cake and snacks, Pramati’s small group of carolers added zing and warmth to the atmosphere with joyful Christmas carols. Spirits high, the students headed towards a conference room, where they were addressed by Mr. Giri, VP Engineering Services. Following an icebreaker, where the students introduced themselves, the conversation touched upon various topics, from latest technology to their aspirations. 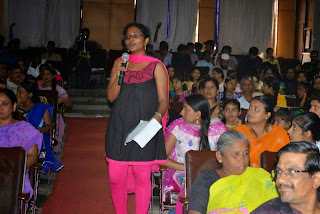 Giving them sound advice, Mr. Giri spoke of the importance of goal setting and encouraged them to think out-of-the-box. 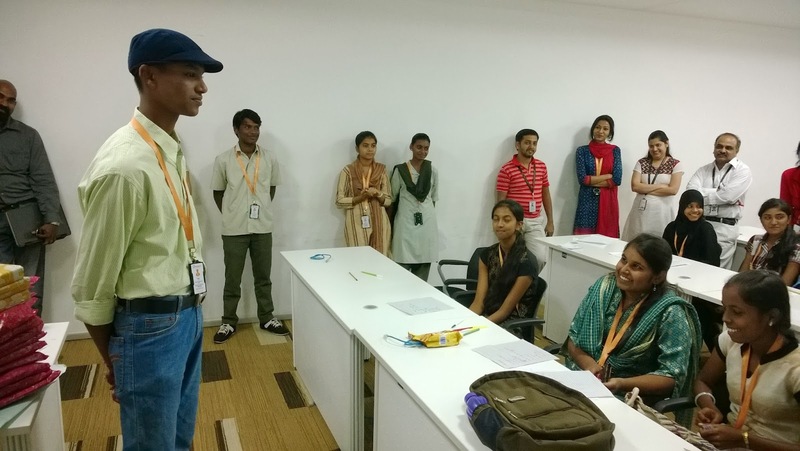 The students were then taken through the various stages in software development, by a team member, Bhavya. From ideation to delivery, all the thought and hard work that goes in made them realize that product development is no child’s play. They were later addressed by Mr.Chetan, VP Human Resources. Talking about valuable life lessons, he told them to be confident and emphasized on the importance of believing in oneself. Inspired by his words and encouraged by his warmth, Afreen, a BCA student, stood up to share a few things about herself, and was promptly rewarded with a packet of chocolates by Mr. Chetan! 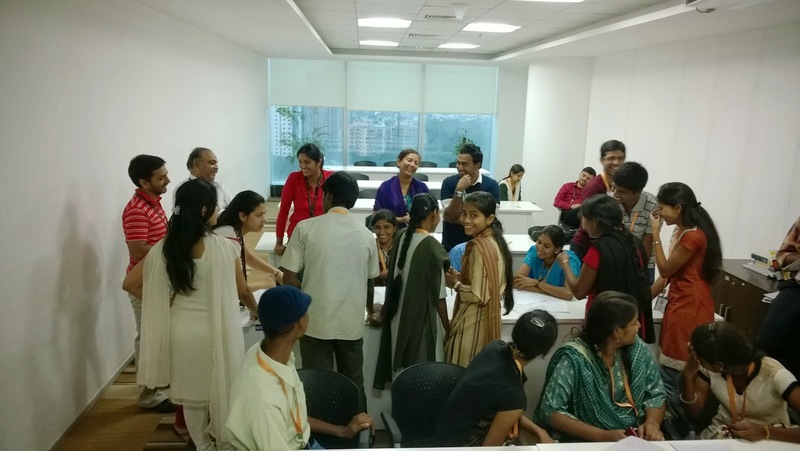 Moving away from the usual, the team at Pramati decided to give the students a taste of a 'typical day in a software company’, through a fun activity. 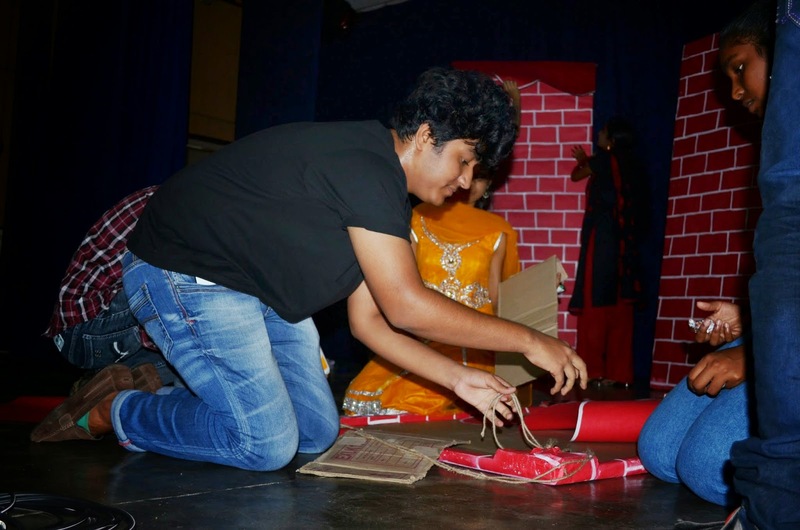 This creative task, designed and led by Srivatsan, who also volunteers and mentors at DSF, divided the students into four teams – requirements, design, testing and delivery. The task was simple-- the requirements team had to gather specifications of the product, the design team had to design it accordingly, the testing team had to check for bugs and finally, the delivery team had to ensure it was delivered to the client on time. The client, Srivatsan, had a simple requirement – an aircraft. As the team at Pramati watched with much amusement, what followed was absolute chaos! The room was abuzz with activity, as the students ran back and forth trying to gather information, conveying it to the other teams, drawing whatever they could from the information received and cross checking it among themselves. Amidst laughter, giggles and excited chatter, the students finally had a product to deliver. After overshooting the stipulated delivery time significantly, the sheepish students delivered, what a team member at Pramati rightly described as, 'the skeleton of a whale’! With no wheels or body and better still, no seat for the pilot, the final product had everyone in splits. As everyone joined in on the laughter, it drove home a very important point-- no idea ‘takes off’ without good communication and team work. As the day drew to a close, it was time to say bye. A usually reticent Naveen, went forward to share his experience and he too was awarded a chocolate for his effort. The team bid us farewell with gifts, a souvenir to remind us of the wonderful day spent with them. Although it had been a long day, the students’ excitement hadn’t ebbed. Energized by the motivating speeches and the fun-filled task, they spoke excitedly about the day’s events, on the way back home. ‘I have never addressed a group my age, let alone people senior to me, but listening to Mr. Chetan speak, I decided to give it a shot’ said an inspired Naveen. ‘I had no idea what goes on in a software company… we learnt a lot’, shared Shwetha. ‘The task was fun and we enjoyed every bit of it’ Vidya gushed. All in all, it was a great day and true to their tag line, Pramati definitely inspired and brought many ‘ideas to life’ for the students.